End of the Carolingian Empire, year 850. Play as the greatest architects of the Kingdom, launched in a frantic competition to impress their King and try to maintain their noble status. Collect materials, cover land with iconic buildings, hire apprentices and watch for them: the weather is dark and your opponents will stop at nothing to get you into the workings! Do you remain virtuous, or will you be tempted by the company of thieves and the benefits of the black market ...? Be the most prolific and original builder, the most dedicated to the construction of the Great Cathedral, beware of your strategic and moral decisions (never forget that you will be judged ...) and maybe you will come out grow up (and rich, and respected)! After his trilogy "From the North Sea", Shem Phillips is back with a new universe, always sublimely illustrated by The Mico, with a strategic and nervous title, always affordable for the less initiated! 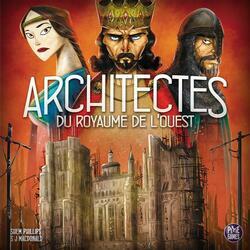 Architectes du Royaume de l'Ouest was funded on the Crowdfunding Kickstarter (See the campaign) platform on the 05 April 2018, the campaign lasted 22 days. 5,083 people helped funded the game, whose the amount requested was NZ$34,000.00. Thanks to these 5,083 people the game could be funded up to NZ$526,052.20, ~1,547.21%.